APRIL 2018: We're excited and gratified to announce that Aging: An Apprenticeship won a Silver medal, in the Best First Book (Nonfiction) category, from the Independent Book Publisher's Association at their annual Benjamin Franklin Awards ceremony in Austin! 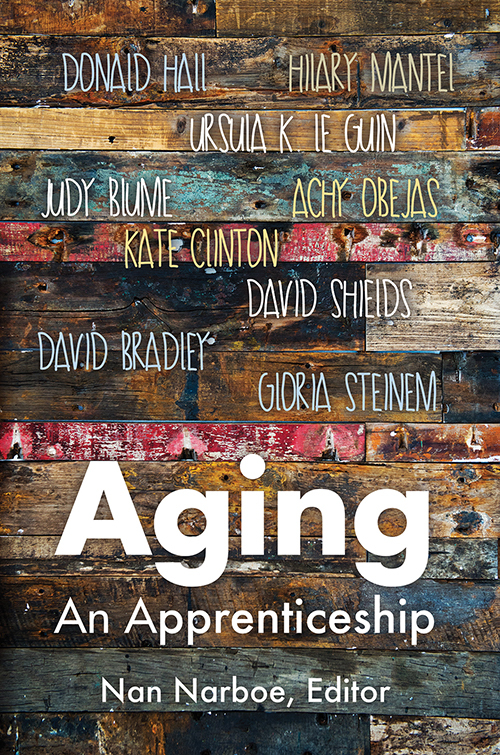 Red Notebook Press is proud to announce the publication of Aging: An Apprenticeship, a collection of essays on aging from an impressive array of contemporary writers, including Judy Blume, Andrew McCarthy, Gloria Steinem and Mary Ruefle. Curated and edited by Nan Narboe, Aging: An Apprenticeship is now available from most major booksellers, and can also be purchased at Amazon, in print and Kindle editions. Nan Narboe's 56 thoughtfully selected essays offer an intimate and lyrical account of aging through the decades. Authors Donald Hall, David Shields, Kate Clinton, Paulina Porizkova, Ursula K. Le Guin and others draw from their own experiences, describing a specific decade's losses and gains to form a complex and unflinching portrait of the years from nearing fifty to ninety and beyond. Drawing on seven decades worth of experiences, the selected essays offer a clear-eyed composition of narratives, each narrative as important as the one before it. In Paul Casey's "Katie Couric Is No Friend of Mine," a colonoscopy, not a red convertible, marks his initiation into mid-life. Germaine Koh, in "Thoughts on Aging," is the oldest player in her roller derby league, confounded by her changing body. Ursula K. Le Guin's "Dogs, Cats, and Dancers: Thoughts about Beauty" meditates on human self-consciousness--it is aging humans who find their bodies surprising. And in "Death," Donald Hall rejects euphemisms: he's not going to "pass away;" he's going to die. More information about Aging can be found at aginganapprenticeship.com.